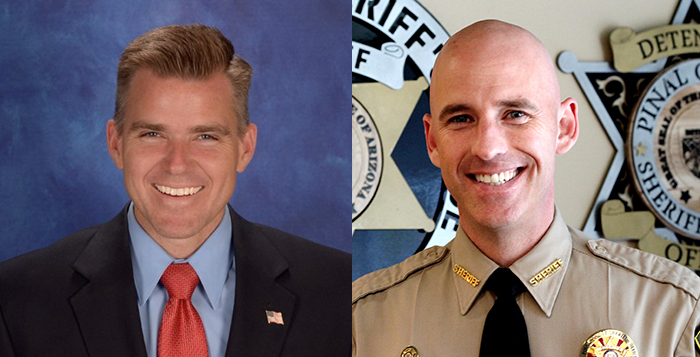 Former county officials Lando Voyles and Paul Babeu maintain the RICO funds were not misspent. Former Pinal County officials are at the center of a report from the Arizona Auditor General that found their offices allegedly misused anti-racketeering funds and violated conflict-of-interest policies. The report, published Aug. 20, focused on $2.4 million managed by the offices of former Sheriff Paul Babeu and former Pinal County Attorney Lando Voyles from January 2013 to December 2016. Auditor General Lindsey Perry forwarded the report to the Arizona Attorney General’s Office for further review. Anti-racketeering monies are forfeited to law enforcement agencies and include cash and proceeds from auctioning forfeited properties. Those funds are supposed to be awarded to nonprofit community organizations to support substance abuse prevention, education, and gang prevention efforts. The report found Voyles allegedly did not always follow procedures to ensure the money was spent appropriately. Of the 82 awards given to 225 community organizations during the time period, 77 did not provide a memorandum of understanding with the county attorney. “Accordingly, the uses of the awarded monies could not be determined,” the report stated. Additionally, half of all the awards did not have applications or written proposals from the beneficiaries and those that did, included incomplete or missing documentation. The County allegedly could not provide documents to show the Community Outreach Fund Committee evaluated the awards as procedure requires. In a majority of those awards reviewed by the state, the county attorney allegedly did not monitor the organizations’ expenditures. “For example, monies were spent on unauthorized purposes such as appreciation events for county sheriff employees and their families and construction for a church dance studio,” according to the report. Current Pinal County Attorney Kent Volkmer said in a response included with the report that his administration took action to account for and document all requests for anti-racketeering money when he took office in January 2017. PCAO now requires those requests be accompanied by applications. Applicants must submit a letter explaining the intended uses and goals of expenditures. Voyles previously threatened Volkmer with legal action in 2016 when Volkmer spoke out about the previous administration’s handling of RICO funds. The report also alleges Babeu and his staff allegedly violated conflict of interest policies and often did not abstain from involvement in anti-racketeering award decisions. The Arizona Public Safety Foundation received the largest number of awards out of any organization, equaling a total of $683,406. County sheriff employees held officer positions on the foundation’s Board, performed accounting functions, approved transactions, held foundation credit cards in their names and allegedly initiated some of those funds on the foundation’s behalf. In all, the report states the former sheriff and county attorney dispersed $151,645 of community outreach award monies for unauthorized purposes that benefited their own programs, such as Babeu’s morale, welfare and recreation programs. “These included events such as golf outings, holiday banquets, a Diamondbacks baseball game and movie nights,” the report stated. More than $60,000 was used to produce public service announcements for both offices, unrelated to substance abuse prevention, education and gang prevention. Current Sheriff Mark Lamb said PCSO has separated from the Public Safety Foundation and instituted a new process for the review of anti-racketeering fund requests. A new committee was formed to review those requests, along with other policy changes. Babeu and Voyles maintained RICO funds were not misspent, according to a written statement sent to InMaricopa Thursday. Voyles said he welcomed the audit and it proved his office and Babeu’s were compliant with state and federal laws. “I knew the audit would prove what every independent audit said, that we’ve vastly improved policies procedures and reporting,” Voyles said. In 2017, those policies turned to law, according to Volkmer. House Bill 2477 amended state law and required authorized purposes for county anti-racketeering funds. The law also now requires documentation and information to request and award those funds.